From the moment I spotted Yen Yen Lo's work, I was hooked. From 'Noodle Girl' to 'Bearded Fellow' to 'Self-Conscious Nudist,' each one of these eccentric personalities feels like they've been pulled from a quaint world where whimsy and mundane collide in the most delightful way possible. It's not just Yen Yen Lo's work that fascinates me, but also her story. After 20 years as a graphic designer, the artist took a hiatus from her career in an effort to reconnect with herself. In one of those serendipitous moments that seem unimportant at the time but later prove to be life-altering, Yen Yen Lo enrolled in a ceramics class. She instantly fell head-over-heels for the joy of making by hand - rather than by computer - and proceeded to pursue her newfound art full time. 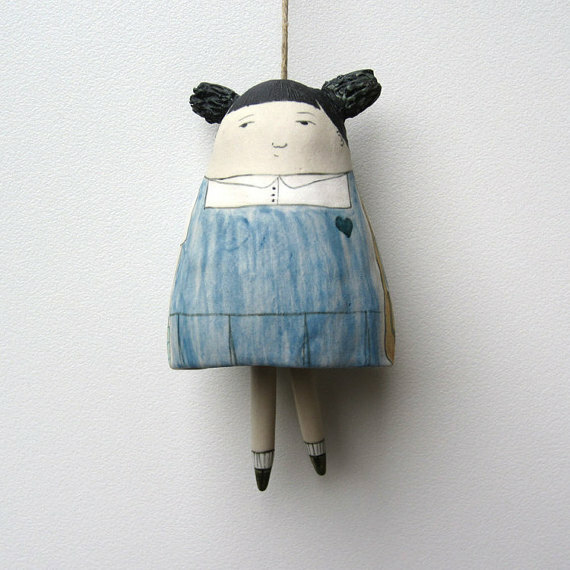 Yen Yen Lo's "anatomically incorrect-looking bell figurines" are inspired by observing the quirky behaviors of the people around her, as well as those who left an impression during her childhood in Malaysia. Wherever she draws her inspiration from, I hope it's a well that never runs dry. Visit Yen Yen Lo's Etsy shop for more of her work or follow her on Instagram for a peek into her process. All images via Yen Yen Lo.